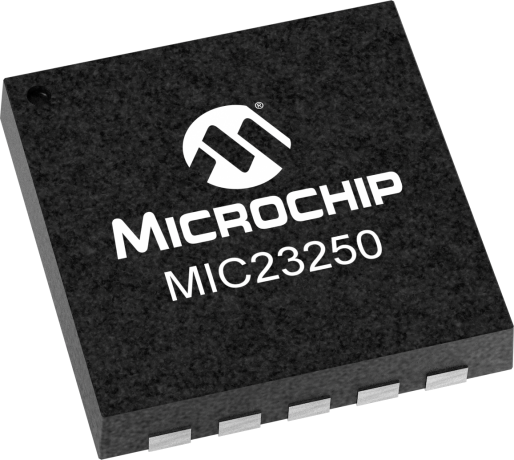 The MIC23250 is a high efficiency 4MHz dual 400mA synchronous buck regulator with HyperLight Load® mode. HyperLight Load® provides very high efficiency at light loads and ultra-fast transient response which is perfectly suited for supplying processor core voltages. An additional benefit of this proprietary architecture is very low output ripple voltage throughout the entire load range with the use of small output capacitors. The devices is designed for use with a 1µH inductor and a 4.7µF output capacitor that enables a sub-1mm height. The MIC23250 is designed to operate over the junction operating range from -40°C to +125°C. MIC23250 - 4MHz Dual 400mA Synchronous Buck Regulator with HyperLight Load?